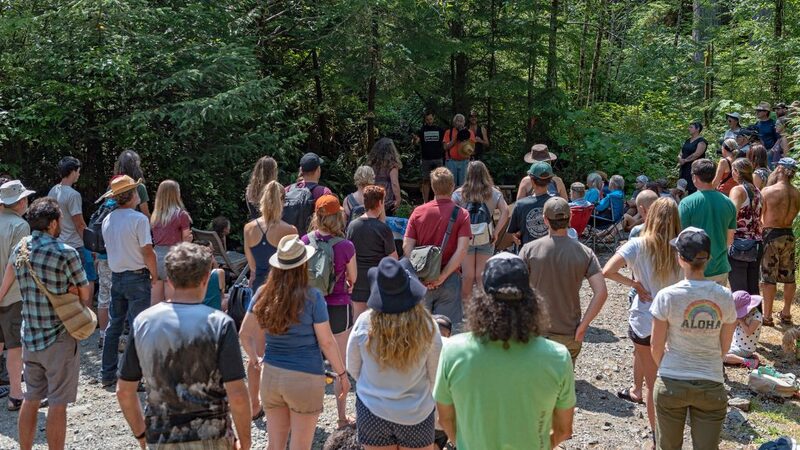 Another great success as over 150 people attended the 5th Annual Walbran Convergence, besides Kaxi:ks (Big River) in unceded Pacheedaht territory. At the opening ceremony Pacheedaht elder Bill Jones welcomed people and was followed by brief talks by representatives of Friends of Carmanah Walbran and the Wilderness Committee and then Private Public Workers of Canada president Gary Fiege, MLA and Green Party Forestry Critic Adam Olsen and Federal MP Alistair McGregor who all made the long dusty journey to share their passion for forestry reform and the protection of the Old Growth. 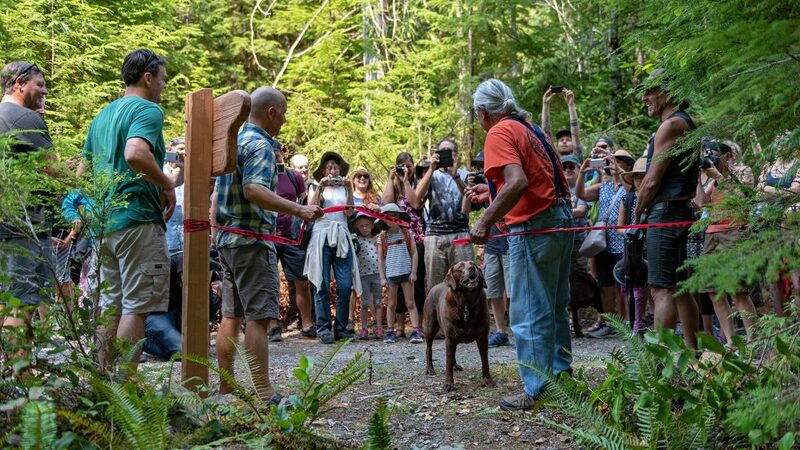 This was followed by Bill Jones and Adam Olsen cutting the ribbon on the spectacular Emerald Loop Trail which makes it possible for elders and others with mobility issues to access the forest with its giant Cedars and the Emerald Giant and Emerald pool. Guided hikes followed with a community dinner and a acoustic performance by folk troubadour Luke Wallace. Those who stayed for Sunday were welcomed by a pancake breakfast served by the Sierra Club. Special thanks to all the donors and notably Ruby Red Blueberry Farms, Tree Island Yoghurt, Caffe Fantastico, Wild Fire Bakery, Norm Smookler. Thanks to everybody who made the long journey on the Community Access Bus and many many… many thanks to all the inspired volunteers who made this event happen, trail builders, cooks and organizers. See you all again next year! 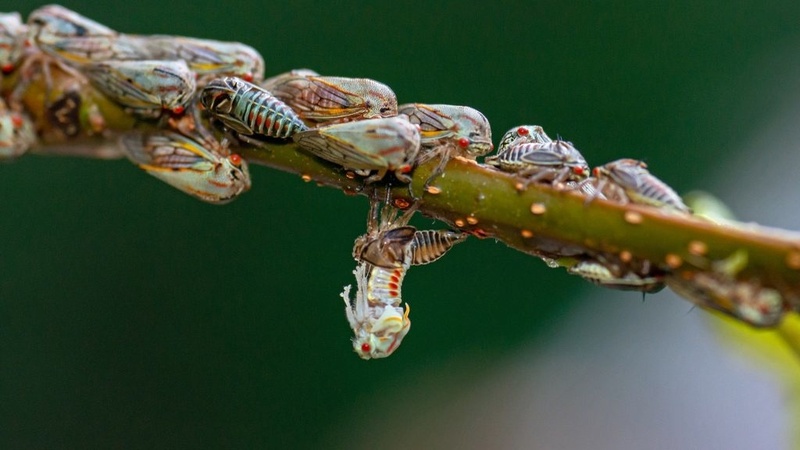 Some other Convergence attendees, Tree Hoppers, Platycotis vittata . Walbran Convergence, July 28th-29th 2018. Photos James Holkko.